We all want to stay at five-star hotels when we travel, but how do we rank our workplace where we spend so much of our time? 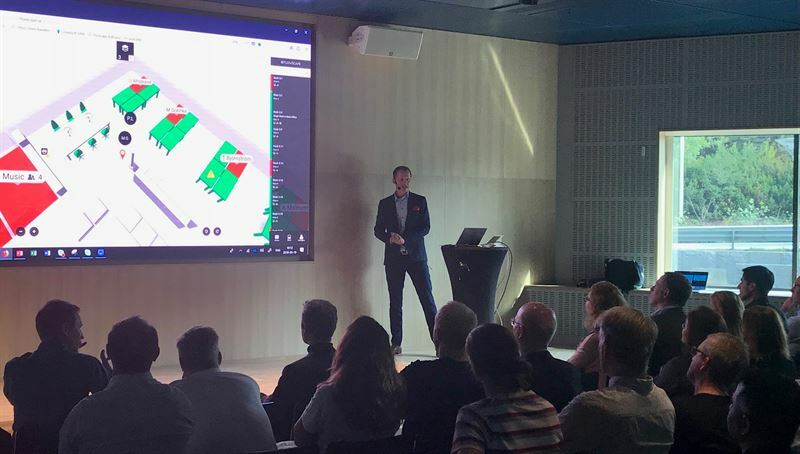 Flowscape’s CEO Peter Reigo shared some visions on a morning session at ÅF in Solna together with our partner Cisco. Which services can digital tools offer the workplace in the next few years? At Flowscape, we believe that the opportunities are limitless, but here are some visions that were brought up when Peter Reigo talked about the smart building. Concierge: When you spend a lot of time at the office, it might be nice to have a service available in your digital office solution from where you can order and pay for food in case you work late, book dry cleaning, or why not order snacks and beverages for the after-work on Friday. The service doesn’t need to be limited to the workplace and could also help with everyday activities like a reminder about when to go to the bus to get to the morning meeting in time or picking up the kids at kindergarten. Gamification: Through different challenges, employees can receive points in internal competitions, which increases engagement and builds a stronger Employer Brand. Gamification can also be used to increase a nice atmosphere at the workplace – by awarding points to those who contribute to “positive office guidelines” – which can mean digitally measuring if employees cancel meeting room bookings that are not used, that employees make sure their workplace is tidy at the end of the day or making sure to avoid speaking on the phone in quiet zones. Guest experience: When invited to an external meeting, you could get the meeting information, address and info about parking spots and their availability instantly in your phone. When arriving at the company, you could be automatically checked in at the reception while receiving instant access to their Wi-Fi network. Social at work: At an activity-based office, where you have the possibility to change your seating every day, it’s important to make it easier for staff to maintain internal networking and get to know new colleagues. If you are more introverted, it may not be as easy to find colleagues to have coffee or lunch with. Flowscape’s “Colleague Finder” is a function that brings colleagues together to meet physically, and there are more exciting ideas in the road-map looking forward which will help bring a more inclusive company culture.